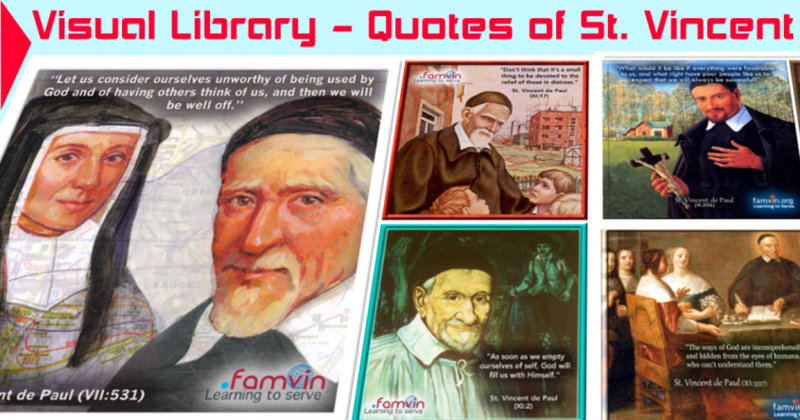 Search our image database of quotes. Search the quotes in the images that are posted to Facebook daily. Type a word or phrase in the box below and then click Search. Thanks to a volunteer, Deirdre Noonan, for making this search possible. Click here to download a PDF file containing many quotes of St. Vincent, with the source indicated in format Volume:Page from Correspondence, Conferences, Documents edited by Pierre Coste, C.M. Thank you Sr. Marguerite. Going forward we will add the source. We’ll also be posting soon a searchable PDF file containing all the quotes in the list that we’ve been using, and their sources. Vicentinos, gracias por su tantos recursos valiosos. Dónde puedo conseguir el PDF con las frases en Español? How fortunate you are to be the instrument of Our Lord in forming good priests (VI:413).